Après la sortie d’un premier EP, nommé « I », chez Nek-Ros en 2013, et « II », en 2016, chez Sweepland Records, le groupe s’est aguerri au cours d’une cinquantaine de concerts à travers l’Europe. Aujourd’hui Sons of Apache présente son dernier EP, nommé « III » totalement autoproduit, et sorti chez Seche Productions. 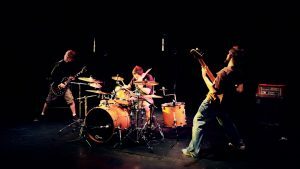 Sons Of Apache is an instrumental stoner rock band from Dieppe (France) created in 2010 and composed by Tok (Guitar), Zarba (Bass & Vocals) and Gromano (Drums). The combo presents its own vision of the genre, gathering influences which make it thrill. Humbly borrowing to the classic bands of this kind of music (Karma To Burn, Atomic Bitchwax, The Melvins…) as to the great bands of the History (Jimi Hendrix, Frank Zappa, Led Zeppelin, Tool…), the trio engage itself in a real rock music, with the idea to let instrumental express itself. Goal stills simple, to play an energic music, often powerful, sometimes sensible, but always nervous and eclectic, on the stage and in the music. After the EPs « I » (by Nek-Ros) , « II » (by Sweepland Records) and 50 concerts in Europe, the band will release « III » in October, entirely composed & produced at home, with Seche Productions and Sweepland Records.